afue Horse Safaris own 30 working horses, which are a mixture of Boerperd, THB, THB crosses and Warmbloods. All the horses have been personally selected by Steven and his wife Lucy for their confirmation, paces and temperament to work in the African Bush. Whilst not on safari our horses are classically schooled with simple dressage movements to ensure that they are light in the hand and responsive to the leg, thus being the perfect partner to your perfect African Safari! As rides are in an area of dangerous game, they can only accept intermediate or advanced riders. There will be ample opportunity to gallop the horses across the wonderful open plains of Kafue so all guests must be of a standard to control their horses at this pace. Horse Trails along the Zambezi River, near Victoria Falls. Riding into the teak forests and wilderness areas, crossing over rivers and camping out along the banks of the river is one of the better ways to enjoy the awesome beauty of this area. 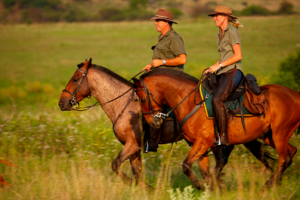 Chundukwa Adventure Trails offer overnight rides or 2 hour rides in the early morning or late afternoon. This is by far the best way to view plains game in close proximity as the animals are unfazed by the horses moving nearby. Lilayi Lodge, just outside Lusaka is the only game lodge offering this facility in Zambia as most of the bigger parks have tsetse flies which preclude the introduction of horses.